Beginning mid 2016 PouchNATION has extended its abilities to manage the guests’ journey from the very beginning, event discovery and ticket purchase. PouchNATION has executed events including the first cashless events in Indonesia, Philippines, Vietnam, Malaysia, Thailand and Myanmar. How to have a Venue Manager’s access in our web application? Provide an email address to our admin and request for a venue manager account. When the above request is done, auto-generated password will be sent to the provided email address. How to connect the apps for the first time? Login to our website https://events.pouchnation.com/auth/login using the provided email address and generated password sent through email. Upon successful login, select a venue that needs to be integrated with Cloudbeds. Go to Venue > Utilities (this is where the integration feature is located). Find Integration section for Cloudbeds and click ‘Integrate’ button then wait for the page to be redirected in cloudbeds login page. 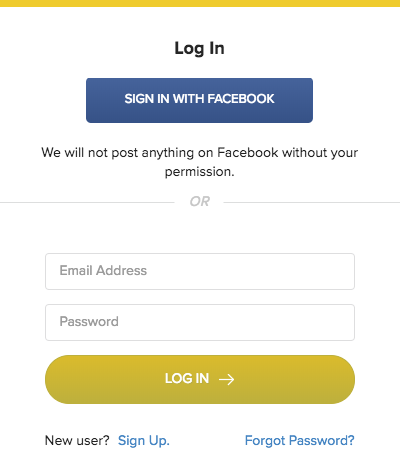 Login with Cloudbeds myfrontdesk account. Click ‘Approve’ button to allow integration between PouchNATION and Cloudbeds. After approving, page will go back to PouchNATION > Venue > Utilities. ‘Integrate’ button will now be hidden and check mark icon will be displayed as a sign of successful integration. Integrate button will only be displayed again once the connection has been disconnected. Note: Upon successful integration, a custom field ‘assignedReservations’ will be automatically added to the guest details on Cloudbeds. This custom field will contain value if the reservation is already claimed and exchanged with wristband. To use the feature, go to Venues > Options, check ‘Cloudbeds Guest Search’ and click save. 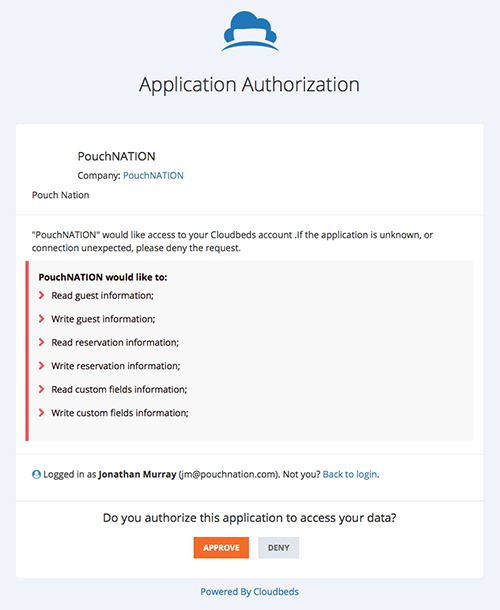 This will allow searching of Cloudbeds reservation ID on PouchNation devices. Integration with Cloudbeds will give our mobile app the privilege to search guests with reservations in Cloudbeds and with this feature, guest could claim their tags efficiently since necessary fields (first name, last name, email address, birthdate, mobile number and gender) will be auto-generated from guest’s reservation details. Only guest’s reservation id can be used as a search criteria upon searching of guests thru our mobile app. How to disconnect the apps? Disconnection will automatically happen when a venue stopped searching guests for 30 days straight. But if a client wants a disconnection before the automatic disconnection, he/she may request it to our technical support. If they cannot search guests with Cloudbeds reservation id due to disconnection, they can login to pouch web application and integrate with Cloudbeds again.